Participants at a just concluded peace and security conference in Jos have alarmed that there is a growing suspicion and distrust amongst local communities in Plateau State. This according to them is largely as a result of unprofessional conduct among some security personnel serving in the state. The development according to a communiqué drawn at the end of the conference which focused on “Resurgence of Violent Attacks in Plateau State: Forging a stakeholder Partnership for Peace and Security” has given rise to a "conspiracy of silence" in most rural communities as evident in their unwillingness to volunteer information to security agencies. This the communiqué says has further exacerbated the already "precarious (security) situation" in the State. "The inability of security agencies to act professionally and to respond to early warning signs was largely responsible for the recent attacks in some parts of the state," it says. 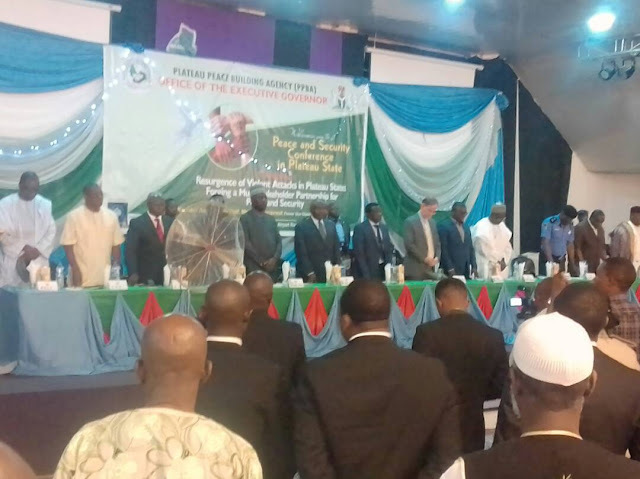 Plateau Peace Building Agency noted that an existing gap between early warning and early response by relevant authorities was partly responsible for the resurgence of violent attacks in the state. It also faulted the "poor, and in some cases absence of interagency cooperation" which it says has 'significantly' diminished the capacity of security agencies to tackle 'head-on', the growing challenges of Peace and security in Plateau state. It however expressed belief that the creation of state police was the likely solution to the violent attacks in the state and country at large. "The inability of state governors to have direct control over security agencies has grossly undermined their role as chief security officer at the state level. "Therefore state governments should be allowed to create state police which should be placed under the direct control of state governors in order to further enhance their capacity to protect lives and properties of their people," the communiqué said. It also called for the strengthening of existing security outfits to effectively tackle insecurity while lauding the effort of the Plateau State governor Rt. Hon Simon Bako Lalong for creating the PPBA as the foremost institutional framework dedicated to conflict prevention and peace building in the Country and called on the government and other relevant stakeholders to support the Agency to deliver on its mandate. Organized by Plateau Peace Building Agency (PPBA) in Conjunction with the United States Institute Of Peace (USIP), with Support from Mercy Corps, held at Crest Hotel, along Old Airport Road, Jos On July 30th – 1st August 2018, the conference was borne gainst the backdrop of the resurgence of violent attacks in some parts of Plateau state. This was with a view to take a critical review of the Peace and security architecture of the state as well as proffer practical suggestions on how we can collectively address the emerging trend. The highly interactive conference was structured into power point presentation, panel discussion and plenary which provided for question and answer sessions. It was also expected to suggest proactive and realistic measures that would help to reduce or mitigate the return of violent conflict in the state. Participants were drawn from relevant government Ministries, Departments and Agencies, Civil Society Organizations, Traditional institutions, religious bodies, women and youth organizations as well as the media amongst several others.